The Green Mountains of Vermont have formed the physical backdrop for most of my life. Although I can name only a handful of peaks by sight, it’s impossible to mistake the contour of Camel’s Hump. It’s iconic enough to display prominently on our state quarter. It also happens to be one of my favorite hikes. I have logged many miles up and down its trails. I first summited the Hump alongside family as a middle schooler. Over the years, I’ve gone back to explore the remains of the old plane crash, completed an End-to-End Long Trail thru-hike, and visited countless times one summer season when my boyfriend, Luke, worked as a caretaker for the Green Mountain Club. 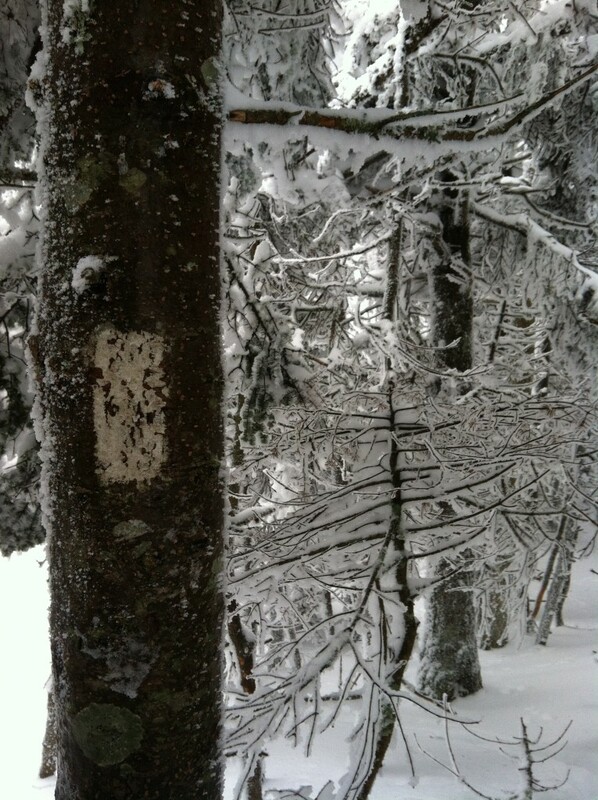 A year ago, a two-day snowstorm hit Vermont, leaving a blanket of wet, heavy snow and downed power lines in its wake. Luke and I couldn’t resist: hiking the alpine zone post-blizzard would be a first. Armed with microspikes, hiking poles, tons of layers, and a thermos of hot chocolate with bourbon, we set off for the mountain. A handful of cars were in the parking lot upon our arrival. A striking difference from summer weekends, when two parking lots are often full, with spillover cars haphazardly lining the thin, rutted, dirt road entrance. It’s difficult to describe the odd sensation of walking through a landscape that is at once familiar, yet absolutely foreign. It felt like returning home after a long time away. Everything was just where it should be, but it felt as though I was seeing it for the very first time. Most of my hiking is done in warmer months and much of it is done alone. To me, solitude and quiet are essential elements of any trip to the woods, and this, too, was amplified. The snow muted our steps and its weight on the trees halted the whispering of leaves and branches. Despite the surrounding beauty and the desire to take it all in, the cold kept us moving. Hiking too fast necessitated taking off layers; taking breaks led to chills, achy fingers and toes. Slowly, we found a steady rhythm in our footsteps. The all encompassing silence became punctuated only by the sound of my heart thrumming in my ears, and the steady stream of clouds following each exhalation. 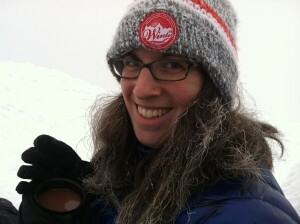 Frost formed on the hair hanging loose under my hat, satisfying proof of my exertion. 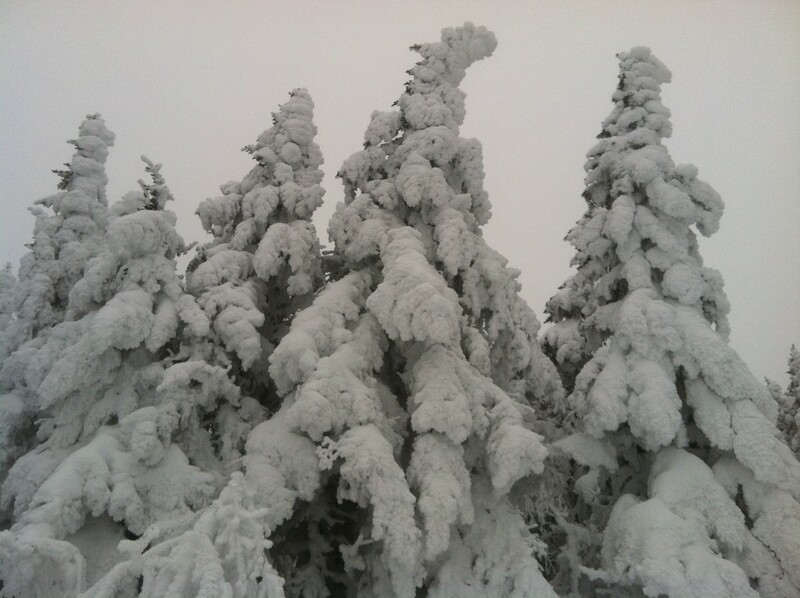 As we gained altitude, the rime ice formations on the trees were unlike any I’d ever seen before. With nothing but shades of white above and below me, and sharp geometric lines cutting across the trees, it was as if we were tramping across some other dimension. This feeling was underscored when we reached the summit and stood alone in a cloud, visibility stretching no further than ten feet in any direction. After countless days spent on top of this summit with melting chocolate bars, throngs of people, and endless views, this blank world confounded my senses. We enjoyed a celebratory cup of steaming hot chocolate (thankful for the punch provided by the bourbon), before making our way back to the relative warmth and protection of tree line. Taking our microspikes off, we made quick work of getting down the steepest part of the descent by simply sitting down and enjoying the ride. Again, my heart rate quickened, but this time is was pure adrenaline. Glissading one after another, Luke and I made quick turns, navigated around sharp obstacles, and suffered from fits of uncontrollable belly laughter. There is nothing more satisfying than a mountaintop. Besides, perhaps, seeing a favorite summit from a whole new perspective. Beautiful piece! I live less than a half hour from Camels Hump, and I feel like I know better than the back of my hand. 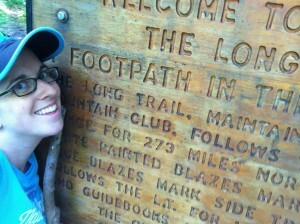 I credit it with having a huge influence on my love of hiking. Yes! The Green Mountains sparked my love for mountains early on — very fond memories of Spruce and Hunger too. 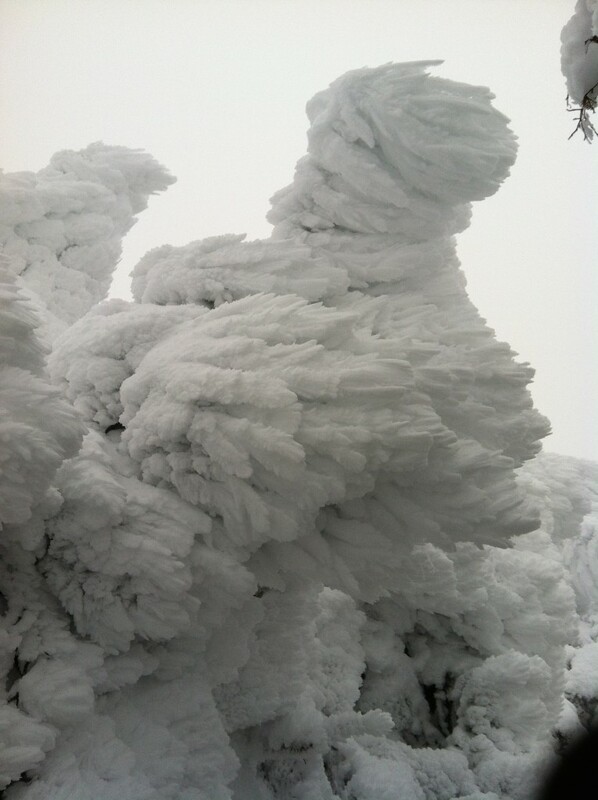 Love hiking Camels Hump during the winter! My boyfriend and I bring sleds for the way down – I highly recommend it!! I lived in Montpelier for seven years, and I loved seeing Camel’s Hump silhouette on a regular basis. 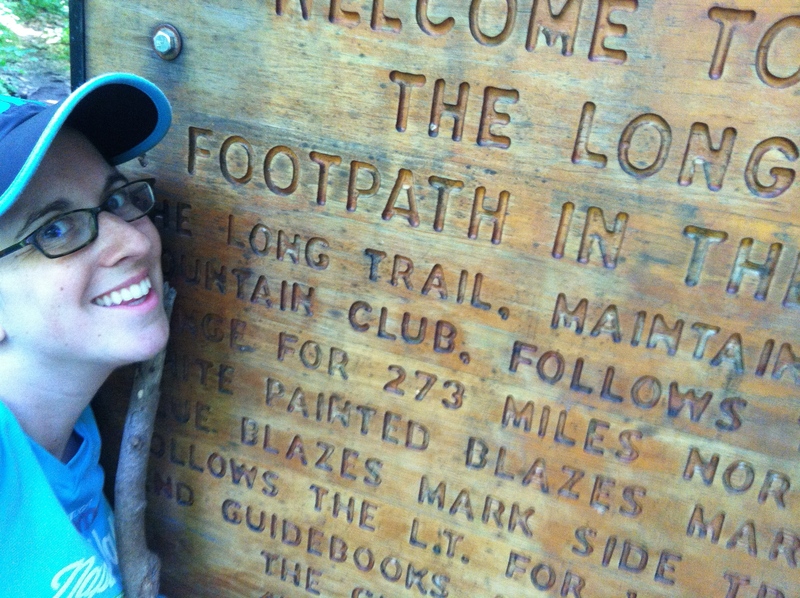 I’ve hiked it many times in all seasons, and had my first stint at winter camping at the Montclair Glen Lodge. My husband and I hiked it this year on New Year’s Day!